Results for October and November SkillSelect invitation rounds have been released this week, and we have results up to the 23rd of November 2016. 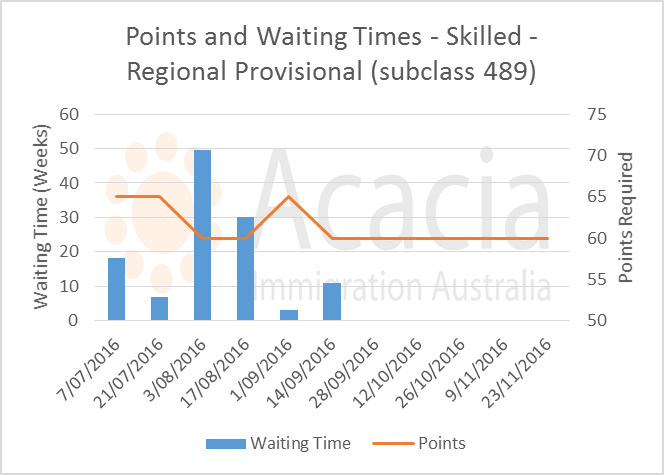 As a result, the pass mark and/or waiting time for these occupations is very likely to increase. Our article looks at recent SkillSelect trends, and gives a prediction of what to expect for the most commonly used occupations going forward. 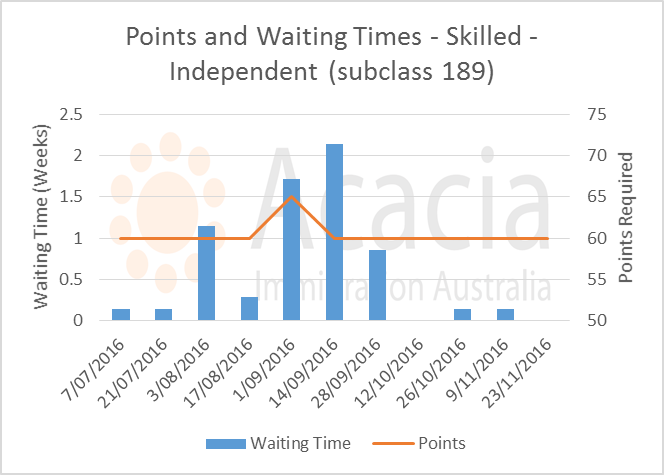 The minimum score required for applicants to receive an invitation for a Skilled Independent Subclass 189 Visa remains at 60 points for occupations which are not "pro-rata". 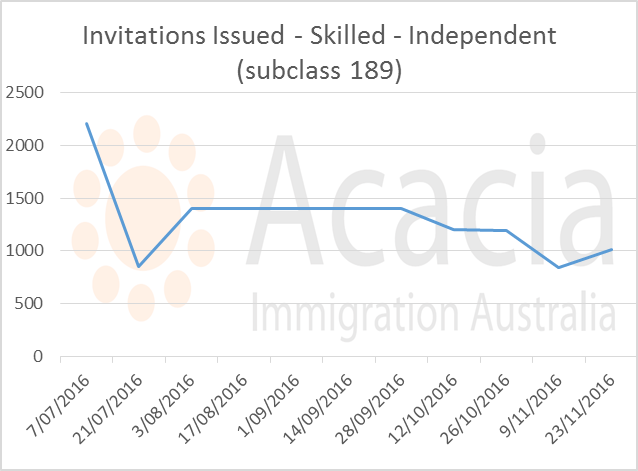 It appears that insufficient eligible applicants are lodging EOIs to meet the target for the Skilled Independent category, and we have seen the total number of invitations issued reduce from 1,400 per round to 845 in the 9 November round and 1,016 in the 23 November round. As a result, non-pro rata applicants can expect an invitation next round with a score of 60 points. There are now 9 "pro-rata" occupational groups, with 3 occupations added in November. For these occupations, the number of invitations issued in each round is limited so that the ceiling is not filled too quickly. As a result, the minimum points required for an invitation may be higher or the waiting time longer for an invitation. This occupation has been added in the last invitation round. 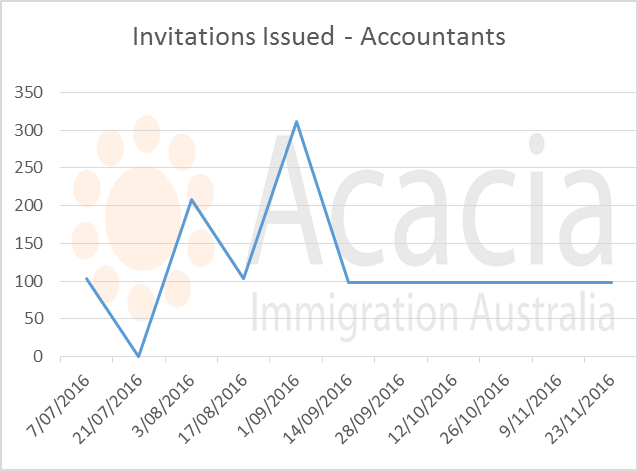 Approximately 60 invitations had been issued per invitation round since July 2016. 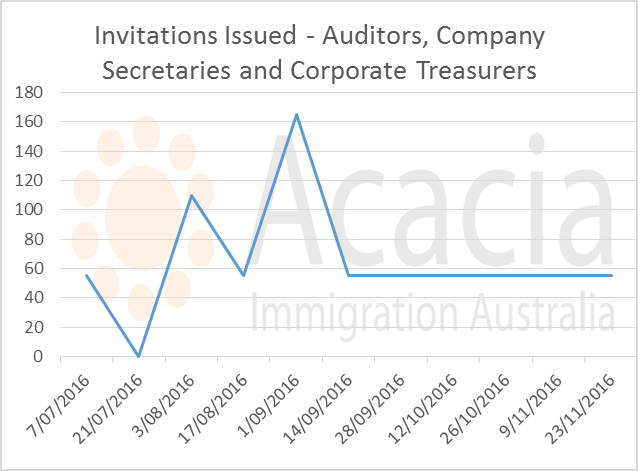 In the 9 November round, no invitations were issued and in the 23 November round, 29 invitations were issued. At this stage, we do not have any information on what the minimum points score was for an invitation in the 23 November round. The occupational ceiling is only 58% filled, so we expect the minimum score to remain at 60, though waiting time for an invitation may increase. The occupational ceiling for Industrial, Mechanical and Production Engineers is now 84% filled. The minimum score for a 189 invitation in the 23 November round was 70 - a significant increase from the 60 points which had been required up to this point. 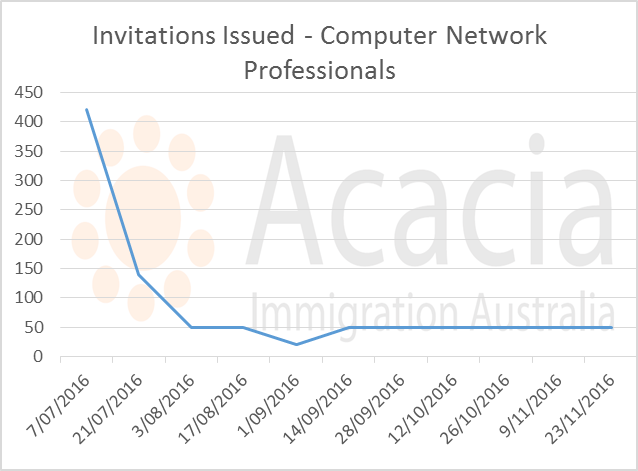 Only 17 invitations were issued - this was down from an average of 140 for July-October 2016. The 23 November results indicate that this occupational group is now pro rata. This is very unexpected because the occupational ceiling is only 7.6% full. 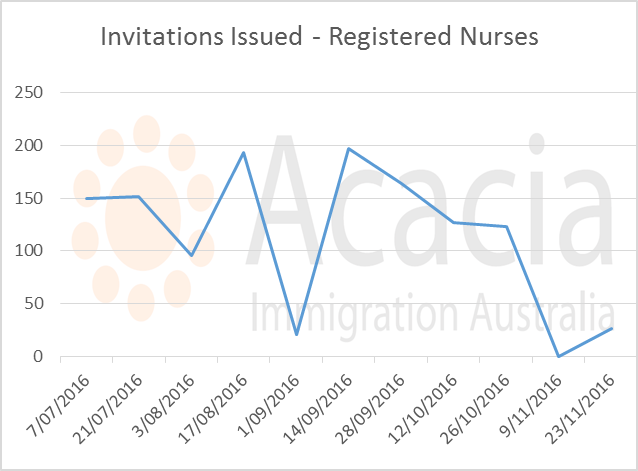 We do not know the minimum points score for an invitation in the 23 November round, but can see that only 27 registered nurses were invited which is down from 135 per round for the preceding period. This would indicate that the occupation will be more competitive for the remainder of the 2016-17 program year. Invitations numbers remain stable at 98 per round. 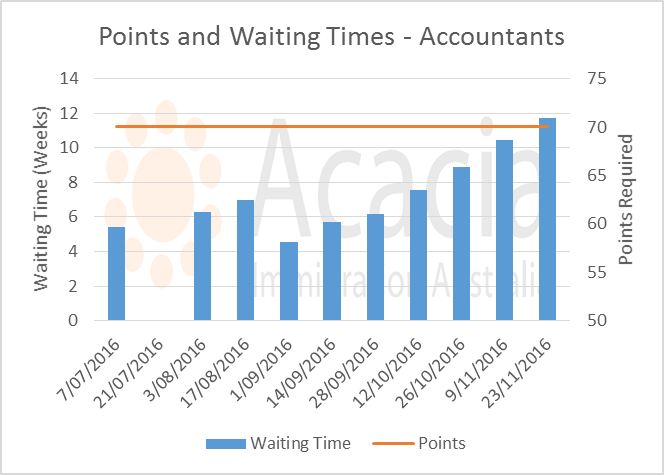 The minimum score remains at 70 points, and we see waiting times gradually increase. This would suggest that the minimum score will remain at 70 rather than reduce to 65 as it did last program year. Invitation numbers remain at 55 for this group, and the minimum score for a 189 invitation is still 70 points. 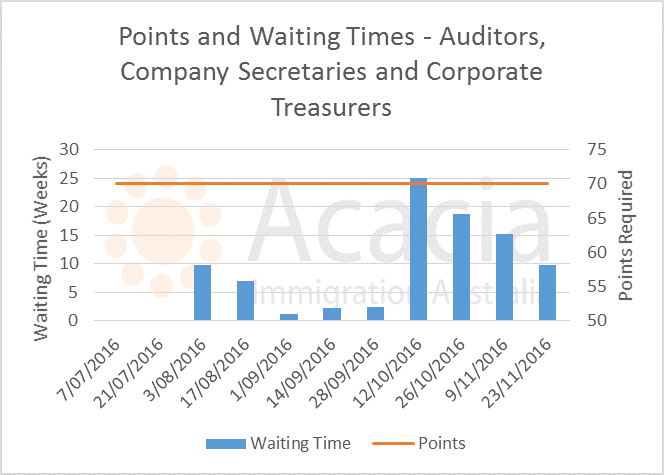 Whilst waiting times have reduced over the last few rounds, it is still taking 10 weeks to receive a 189 invitation with 70 points as an auditor. Minimum score for ICT Business and Systems Analysts remains at 65. 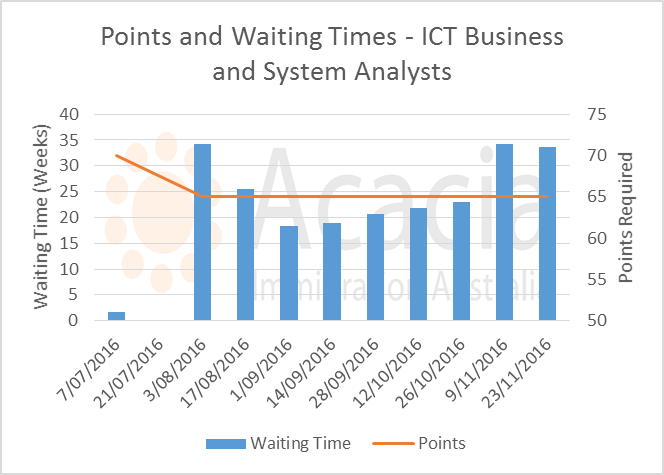 Waiting time has increased markedly in the last few rounds and is now 34 weeks meaning it is the most competitive of the IT occupations. 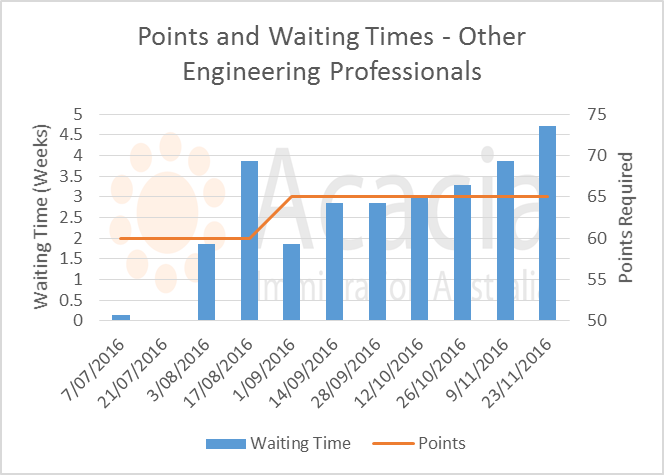 The waiting time suggests the minimum invitation score will remain at 65 or possibly increase to 70. 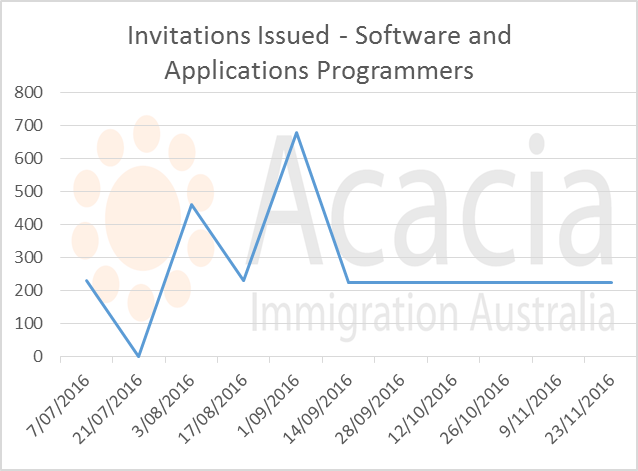 Minimum score required for an invitation for Software and Applications Programmers remains at 65. Waiting time is increasing gradually, but is still under 4 weeks. 65 points have been required for an invitation since September. Waiting time has increased, but is still only 4 weeks at this score. Points required for an invitation remain at 65. 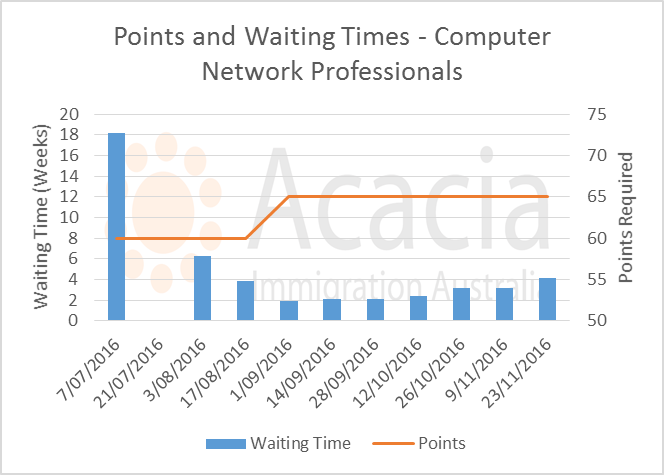 Waiting times have been increasing but are still under 5 weeks. 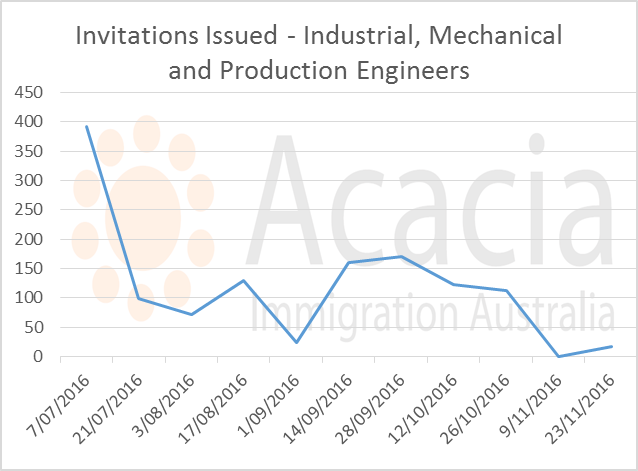 The number of invitations issued to family sponsored 489 applicants had been at 100 per round since July 2016. 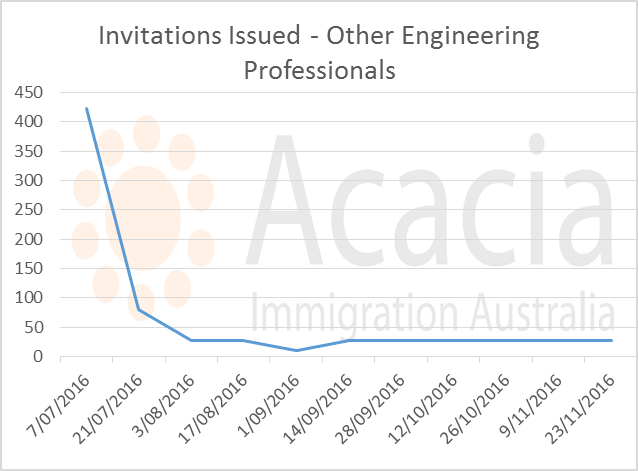 We have seen a dramatic collapse in invitation numbers in October and November, which means that insufficient eligible EOIs are being lodged for this subclass. Minimum score required for an invitation is 60 - including the 10 points for family sponsorship. The 489 is a great option for people with an SOL occupation which is not on the pro rata list. 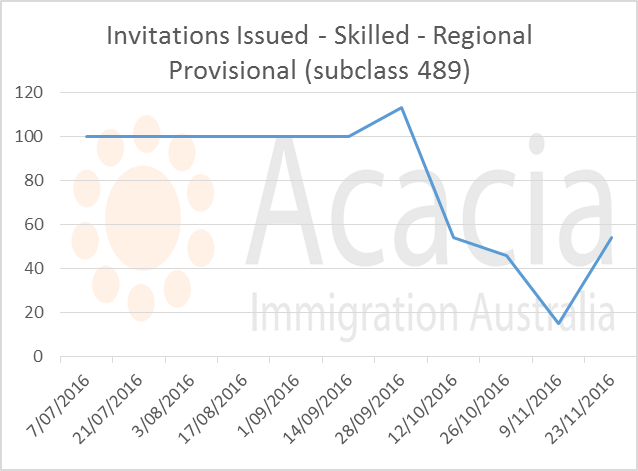 People in pro-rata occupations will find it difficult to obtain an invitation for the 489 subclass as the 189 category is prioritised. Invitations for 489s in pro-rata occupations will only be issued if the occupational ceiling is not filled in subclass 189. The landscape continues to change rapidly for SkillSelect. The addition of 3 new occupations to the pro-rata list will make these occupations more competitive for the rest of the year. 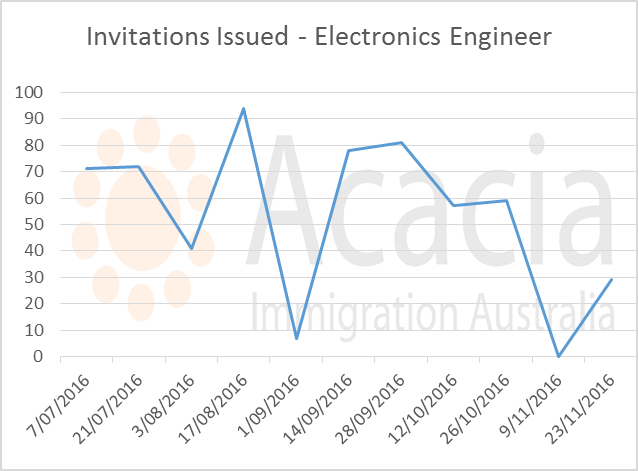 Industrial, Mechanical and Production Engineers will need 70 points for a 189 invitation going forward, and invitations will also be tight for Electronics Engineers and Other Engineering Professionals. We expect the current score of 70 for accountants and auditors to continue. 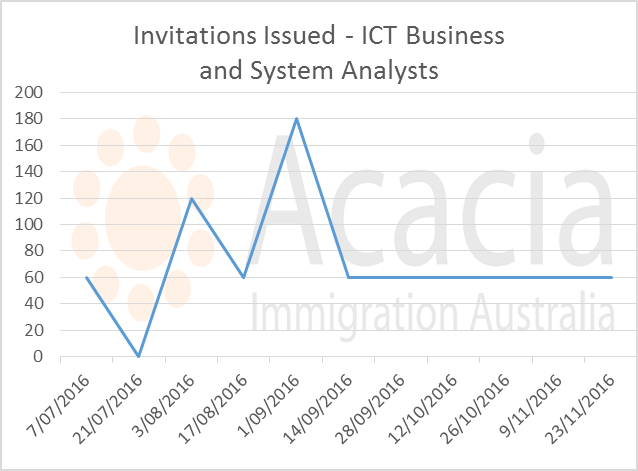 For IT professionals, ICT Business and System Analysts can expect either an increase in minimum score for a 189 invitation, or possibly even longer waiting times. 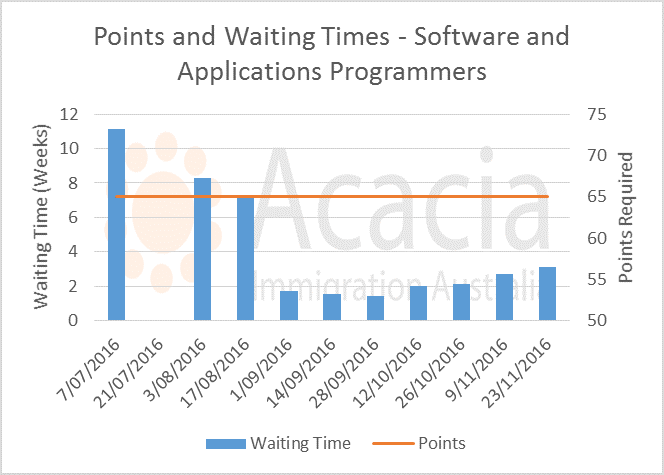 The situation for Software and Applications Programmers and Computer Network Professionals is much more favourable - 65 is likely to remain the minimum score and waiting times are reasonable with these points. The situation for registered nurses is not yet clear - rationale for adding the occupation to the pro rata list is not obvious and we will need to wait for future invitation rounds to be able to give an indication of likely minimum score for an invitation. If you live overseas or are currently travelling, you should consider a Skype or phone consultation.